Why Omegle Are So Popular? It's just a new website; nearly popular from 2008. Charoulette and Omegle became more popular at 2009-2010 and after that similar sites occured. Their popularity is because of their quality; free and fast service; no need membership or login and only a webcam and age 18+ enough. Also you can see people from any country online. That's why they are popular. You can see a list of free cam chat sites given below, iddin is text chat and Chatrandom is video chat; Tinychat gives free chatting groups and Chatroulette gives Premium search option to users. Tohla chat is a chatting area generally with Indian people and Camzap is known as adult video chat site. It's because of you may want to try similar sites or you can try a new and different version and also may be you are banned on Omegle. See how to unban on omegle too. 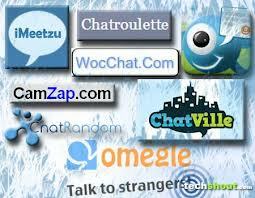 Also check out chatroulette alternatives and sites like omegle too. Chech also How to use Omegle Fake webcam post. You can create own room. Select specific country for chat. Chat with girls: you must register for account. 1. You can create own room. 2. Text chat and video chat. 3. Web cam chat with group of people. 3. Chat by a location.